SOUNDING MY BARBARIC GULP! : Project Food Blog: Ready, Set, Blog! 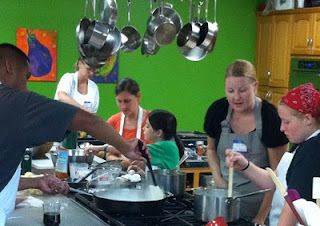 Project Food Blog: Ready, Set, Blog! (at 6:00 pm Pacific time). You can vote for me by clicking the widget to the left of this post. You will have to login to Foodbuzz before your vote is counted. 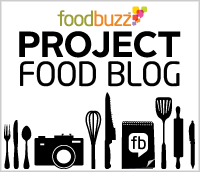 Project Food Blog is the first-ever interactive competition where thousands of Foodbuzz Featured Publishers are competing in a series of culinary blogging challenges for the chance to advance & a shot at the ultimate prize: $10,000 & a special feature on Foodbuzz.com for one year. For the first challenge, we're asking you to create a blog post that defines you as a food blogger and makes it clear why you think you have what it takes to be the next food blog star. Consider what makes your blog unique & sets you apart from other food blog brands: is it your foolproof recipes, your mouthwatering photos, your perspective on family meals? Write a post that comes from the heart and is true to you & your blog. I actually started this blog 5 years ago, while I was teaching a summer creative writing camp for teenagers, to demonstrate how to set up an account & how to post. At first, I posted random nothingness here. After Hurricane Katrina ravaged New Orleans, I used my blog to raise money for my uncle--who’d lost his home, his job, his livelihood--to start a new life. Afterwards, I continued to write posts about my thoughts & daily life. That is, until my marriage started to fall apart. Not wanting to share the details of my divorce with the world & feeling too depressed to write about anything else, I didn’t blog for months. In the spring of 2007, I found myself living alone again for the first time in 7 years. I couldn’t afford cable or internet on my measly adjunct instructor’s pay. Inspired by Julie Powell’s Julie & Julia (which I was reading at the time, long before the movie), I challenged myself to make one new recipe a week as a cheap form of entertainment & to blog about my experiments as a cheap form of therapy. Three years later, I’m still at it. I blog about food because that’s what I love. I'm so obsessed, in fact, that I tattooed the words Bon Appetit with a knife & fork on my ankle last year. As a food blogger, I strive to teach myself new things about cooking & keeping a blog encourages me to continue learning. After three years, I still post exclusively about recipes that I’ve made for the first time. And, boy, do we like to get crazy in the kitchen, making things like "pig face porchetta," beef heart, & all kinds of wild game (perks of having a hunter husband). Of course, I still have much more to learn about cooking, & I'm also constantly learning about photography, web page design & coding, food styling, & writing. I attended your Girls Night Out at Kitchen Conservatory - You were Great & Fun...Couldn't wait to see your BLOG - you inspired me...I have always wanted to take my Favorite Cookbook & cook from front cover to the back cover. I couldn’t have been happier! Because THAT’S why I teach (I make my living as a high school English teacher). Whether I’m teaching people how to understand Shakespeare’s language or how to roll sushi, I ultimately just want to inspire someone to appreciate something different or try something new. I think I have what it takes to be “the next food blog star” because I infuse food into everything I do. In fact, I blend my love of food with my other loves--reading & writing--as much as I can. As a high school teacher, I try to bring food into many of my lessons. This year my College English students will practice descriptive writing by describing how different salts taste (without using the word "salty"), then learn about food by watching Food, Inc. & researching current food issues. We'll end the unit by making “real” food (No processed foods, Sir!) then having a class party to eat & share recipes. My European Studies class will have a Victorian tea party, where we'll eat cucumber sandwiches & scones while we discuss the literature we've read. Last time I taught the class, I even made a baby cake for us to eat while we read Jonathan Swift’s “A Modest Proposal." A bit morbid, I know, but the kids loved it! Likewise, I incorporate literature into my cooking classes. My favorite class to teach is one designed for kids in which we make foods mentioned in the Harry Potter books. This teaches them not only about cooking recipes like homemade ice cream & béchamel sauce but also about food from another country, like pasties and trifles. Literature is so important to me that my blog title was inspired by a quote from Walt Whitman’s "Song of Myself": "I too am not a bit tamed, I too am untranslatable, I sound my barbaric YAWP over the roofs of the world." And, I once held a dinner party to celebrate Ernest Hemingway’s 1920’s Paris memoir, A Moveable Feast. Food & cooking are just such a huge part of my personal life. I chose to do a backyard pig roast for my wedding reception last April. We spent our entire budget on the food, hiring a chef friend to design the perfect menu that included our favorite foods: artisan charcuterie & cheeses, homemade pickles, truffled popcorn, macaroni & cheese, cassoulet, & peanut butter-bacon truffles. 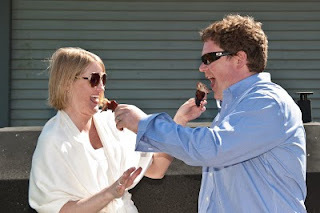 Of course, the whole hog we roasted was the main attraction that day; we cut off the ears and fed them to each other instead of eating wedding cake. For me, cooking & blogging are creative outlets, forms of therapy, learning experiences, & necessities for living a good life. After all, as Virginia Woolf once wrote, "One cannot think well, love well, sleep well, if one has not dined well." So, let me live, love, EAT, & say it well in good sentences. Food blogging sounds like a very integral part of your like, not just a hobby. I am currently reading Harry Potter and I though about making some of the dished mentioned like treacle tart/pie or pumpkin juice. Best of luck in the competition. Hi Kelly. I voted for you too! And I appreciate your honest post -- I can relate to all. Good luck in the competition also! I love the tattoo as your main photo. Pig ear! 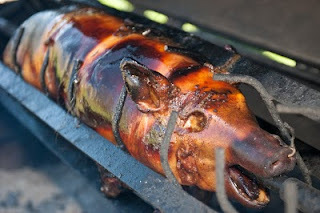 You must visit Cochon in New Orleans and have the fried pig ear and the pig tail. So good!